In the last blog, I mentioned we could almost see the light at the end of the tunnel. Well, that light is shining brightly, and I would like to spell out the last process, and why the ending date is now August 11. First and foremost, please note that when we added back the fumigation process into the project, we essentially tacked on 7 days to the project. Other factors have pushed us back a few days as well, but this explanation should give you a better idea of what is now involved. I’ll set the table first. 18 is now sprigged, and 17 is in process. If it hadn’t rained today, we would have been able to the get the excavator over to 16 to repair the washouts, and get it final graded as well. It appears that the final grading work on each of the remaining back 9 holes can be completed rather quickly, with sodding and sprigging taking place immediately after. But that is not the issue with getting finished on time. The last 3 holes (10, 11, and 12) need to be fumigated, but that cannot be done until irrigation is available to get them wet enough to inject it. 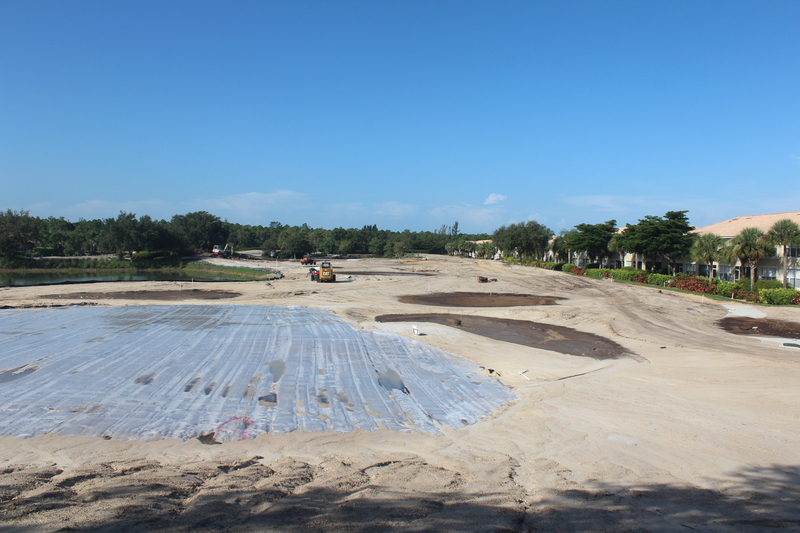 The irrigation contractor will be finished with the irrigation on 10 & 11 by Saturday. We will water those greens in Sunday and Monday, and fumigate starting on Tuesday July 29 at 7 AM. Then we have to wait 5 full days with the tarps on. Now it is Sunday August 3. We take the tarps off, and wait a day or so depending on the weather to let them breathe. They get prepped August 5 & 6. The Architect needs to approve each before we sprig, so that grass can start going in on either the 8th or 9th. And the whole process should be complete by the 11th. There are some strong indicators that we could get finished sooner, but having now experienced how these projects progress, I think I will stick with the 11th in order to be safe. We have now sprigged 17 and 18 at an increased rate of 700 bushels per acre, and will do the same for 14-16 though. Starting next week, we will step that rate up to 800 bushels per acre. The increased density will aid the grow-in, and hopefully make up for the lost time. You will really start to see things move much quicker from here on out. Please reply back with your comments or questions. thank you for your detailed update. Looking forward to seeing the final product. Could you address the budget and are we on track? Our preliminary forecasts show the project is below budget by approximately $3,000. That said, it is too early to discuss final numbers on the project. For instance, we anticipated a change order for extra grass of $11,500, which ended up coming in at $8,384 (great!) However, due to the heavy washouts from recent rains, we have had to hire additional outside labor to keep up, and I don’t have final numbers for that (bad). Once construction is complete, we will sit down with the contractors and review the change orders, and get credits for what they didn’t end up using. Mike: Having been at Spring Run for most of the summer I have had a front row seat to the renovation process. The various steps that have to be taken from the initial killing of the grass to the sprigging of the fairways is time consuming. After seeing it I can fully understand why an exact date for the completion of each hole is difficult to predict. Personally I feel that the progress made has been tremendous and the changes integrated in the design are certain to make the golf course better that it was. The target date of November 1st is, of course, on everyone’s calendar and it would be great to be able to play on that date. If the grow- in stage is compromised by the vagaries of Florida’s weather I would hope that the course opening would not be rushed just to accommodate that date. The number of rounds that the course gets will do more harm than good if it is not totally ready to accommodate heavy play. It is really looking good and will be good when finished. Let’s treat it right from the start. Thank you for sharing your observations and insight. I will make sure the Board sees your comments and keeps them in consideration as we near Nov 1. My compliments on bringing this complex project in on time and at budget. The vagaries of inclement weather, contractor coordination, supply chain difficulties for materials and a dozen other complications have been overcome to culminate in the finished product. That is an impressive accomplishments by any reasonable standard. We look forward to playing on this refurbished course. Our Thanks to all those who have brought it to fruition. Thank you for the compliments! Gregg Meier has done an outstanding job working 7 days a week, and often 12 hour days, maintaining close supervision of the construction, as well as ensuring the young turf is constantly irrigated, and repairing damage due to weather. We are lucky to have him at Spring Run. Greg Meier has performed way over our expectations. It seems like he is here 24/7. All Spring Run residents should appreciate our Superintendent’s attention to detail and let him know that when they get a chance. It is to often we ignore a persons positive contributions but cannot wait to criticize.